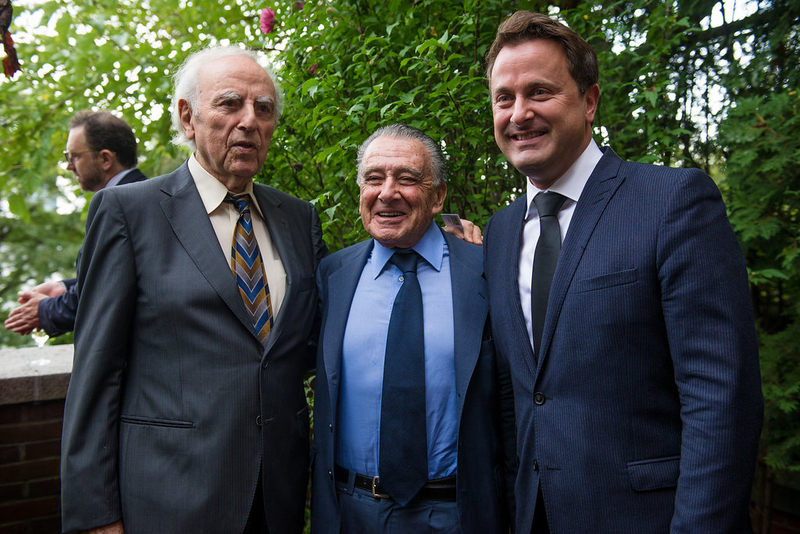 Eduardo Eurnekian and Xavier Bettel. 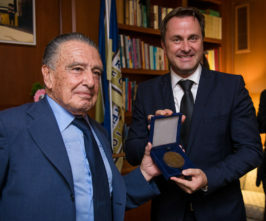 On 18 September 2017 at The Luxembourg House in New York, the International Raoul Wallenberg Foundation presented the Raoul Wallenberg Medal to the Prime Minister of Luxembourg, Xavier Bettel, in recognition of his efforts to eradicate any form of racism and discrimination, his firm stance in favour of human rights and as representative of his fellow-countrymen, like the late Minister of Justice, Victor Bodson (1902-1984), who did not stand idly-by during the Holocaust, reaching-out to the victims of the Nazi persecution. In the name of the educational NGO, its president, Eduardo Eurnekian, stated: Another demonstration of Prime Minister Bettel’s commitment to the cause of the Holocaust was a statement of June 6, 2015, which said: Government apologizes to the Jewish community … for the suffering it inflicts … and the injustices that are committed against it … and recognizes the responsibility of some public officials in the unforgivable acts committed. In turn, Xavier Bettel said: I am deeply honored to receive this recognition. Very honored because you said one of the main reasons was to recognize my responsibility as leader of my government administration. I know what it is to be criticized because you’re different and being different is not a choice. It’s a feeling, it’s my blood, it’s my DNA, it’s my parents, it’s my belief. Baruch Tenembaum, Eduardo Eurnekian and Xavier Bettel. The medal was presented by Eurnekian and the founder of the Raoul Wallenberg Foundation, Baruch Tenembaum. Among the numerous attendance it is worth mentioning the presence of the hostess, Jeanne Crauser, Consul General of Luxembourg in New York; Juli Minoves, president of Liberal International; Leif Pagrotsky, Consul General of Sweden; Mordecai Paldiel, former director of the Department of the Righteous of Yad Vashem; UN mission ambassadors Christian Braun (Luxembourg); H.E. Mr. Joachim Bergstroen, Ambassador/Special Envoy from the Swedish Ministry of Foreign Affairs; Mr. Nuno Mathias, Counselor at the Permanent Mission of Portugal to the United Nations and Rabbi Moshe Grussgott of the Ramath Orah Congregation.